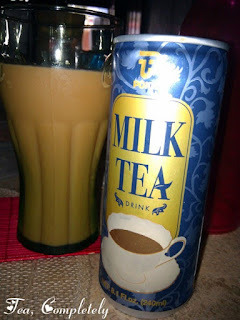 Tea, Completely: Pokka Milk Tea at SM Hypermarket! Pokka Milk Tea at SM Hypermarket! I've been quite worried about my instant milk tea stash. My Gold Kili pack is dwindling fast and I'm still trying to find somebody who can get me some from Singapore. We were trying to find a good brand of Mint tea the other day at SM Hypermarket when we chanced upon (at the bottom of the shelf) a couple of Pokka Milk Tea! The cans looked like people were ignoring it (good for me!). I got one can and tried it out during dinner. It tasted better than the Pokka Milk Tea I got in Singapore! Not sure why, but the canned one tasted a lot better. So when we did our groceries last weekend I got several cans. Weeee!